Countryside magazine. Helen Mark is in the Forest of Dean in search of mysterious geological formations known as scowles and finds herself on the set of the recent Star Wars film. 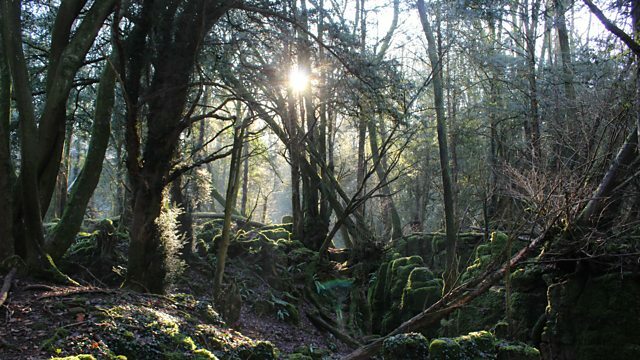 Helen Mark is in the Forest of Dean in search of mysterious geological formations known as 'scowles'. These semi-natural features in the landscape are thought to be unique to the Forest of Dean but are plentiful in this area. They are crater-like features in the woodland that have been eroded over time by water-action and exploited by miners through the centuries for their bounty: iron-ore, coal, and ochre have all been found in abundance in the Forest of Dean. Helen descends into the mysterious, mossy world of the scowles and comes face to face with one of it's inhabitants: a large cave spider and looks for the greater and lesser horseshoe bats. These two species thrive in the craters and caverns of the the Forest. Tales of mining and the blast furnaces that smelted the iron-ore lead Helen across the Forest before she finds herself on a film set. The visually stunning nature of the scowles have led to television and movie crews visiting the area to film in this mysterious, other-worldly landscape. They have become the backdrop to some memorable moments in the TV series Merlin and Dr Who and most famously in the recent Star Wars film, The Force Awakens that was filmed in a part of the Forest called Puzzlewood.